ITV (Independent Television) in the UK was launched sixty years ago today and the anniversary and background has been been the focus of much media attention. It is a significant anniversary as the channel marked the end of the BBC’s monopoly on broadcasting in the UK, and predated the first legal commercial radio stations by nearly twenty years. However, the role of the Musicians’ Union in the weeks leading up to its launch has been largely absent from such accounts. Yet, the Union presented one a number of considerable barriers to the launch of ITV in London on 22 September 1956, and it was only the day before the first broadcast in London that an agreement was reached between it and three of the contractors who had been appointed to provide the programmes for the Independent Television Authority, which had been set up the previous year by the Television Act (1954). For both ideological and practical reasons, the Union was resistant to the notion of independent television. Rather than seeing the pluralisation of broadcasting as a means of increasing the work opportunities for musicians in the UK, it saw it as a threat to its relationship with the BBC. Since the BBC’s inception in the 1920s, the Union had negotiated a staggering array of agreements in the interests of its members as the Corporation became the biggest employer of musicians in the country. 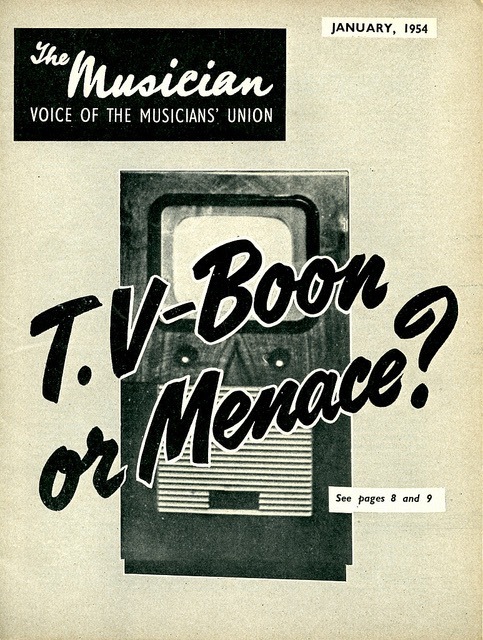 The relationship between the Union and the BBC was one in which the Union enjoyed considerable bargaining power thanks to the BBC’s monopoly and its need for musical performances to fill air time on its increasing number of radio stations and on television. Though relations were not always cordial – with lengthy disputes between the two in 1948 and 1955 – the BBC and MU were in a mutually dependent relationship. As a result, the impending arrival of a rival was seen as a considerable challenge to the Union’s power over broadcasting in the UK. 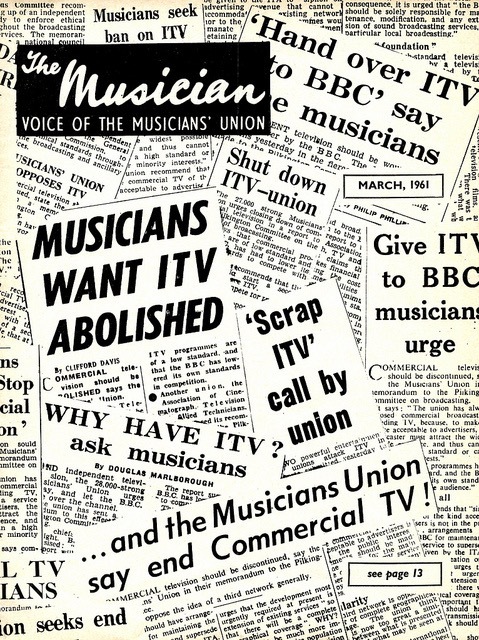 Its initial response to the Television Act was to combine with other unions and organisations representing writers, performers and technicians, to campaign for what they termed ‘satisfactory assurances’ from the new broadcaster. What this meant varied between the different organisations. For the MU, faced with the inevitability of independent television, its main concerns were maximising employment of musicians and placing severe restrictions on any repeat uses of the performances. In doing so, it also aimed to negotiate the highest possible rates for musicians. It was an approach which had served the Union well in negotiations with the BBC but there was concern as to whether the commercial operators would be so accommodating. The alliance of unions made their case to the first Director-General of the ITA, Sir Robert Fraser in 1954, but it was only in the final months and weeks before the first broadcasts that the MU made any significant progress in negotiations. Eventually it was left to the individual contractors to negotiate with the Union and Associated-Rediffusion (who held the franchise for weekday broadcasts in London and the surrounding areas) opened discussions in Spring 1955, asking for the Union’s views on fees for live performances, delayed and repeated broadcasts and for broadcasts that were to be sold for use abroad. The Union wasted little time in setting out its position – seeking £8 for live performances / broadcasts of up to four hours (nearly double what musicians were paid at the BBC for an equivalent gig) and refusing to discuss recordings or repeats until the headline fees had been agreed. Unsurprisingly this presented a number of problems for the television contractors, resulting in a number of press articles suggesting that the launch of ITV may be delayed and a series of protracted, last minute negotiations between the Union and the ITA. For example, Variety magazine reported in August that ‘operators of London’s new commercial TV are having anxious moments and are still not certain they will be able to go live with their scheduled programmes’1, claiming that this was down to a combination of technical problems and the MU’s demands, ‘which would make the whole operation uneconomic’2. The same article quoted one of the (unnamed) TV company negotiators as saying that the MU’s approach gave the impression that the TV companies would be working for the musicians rather than vice versa. In an effort to resolve the issue, the Union spent the four weeks prior to the launch of ITV in negotiations that its Executive Committee later described as involving ‘more time and effort than any others in which the Union had ever been involved’, amounting to ‘substantially more than twenty meetings’3. When agreement was finally reached, it covered only certain types of musical performance on television – namely ‘the use of music and services of musicians for direct (‘live’) transmissions (including relays), ‘pre-recordings’, and repeat transmissions’. For these, the Union agreed a rate of £6 for attendance of ‘less than four hours’ for live or pre-recorded transmissions, with additional payments for recordings of greater than an hour (a further 25% for each extra half hour), repeats (a further 50%) and rehearsals (a minimum payment of £2)4. As a consequence, employing musicians did not come cheap for the independent television companies and when the Union announced the agreement to the press and its branches, the extent of its grip over the broadcasters became apparent. Besides the fees payable to musicians at every step of their engagement with a commercial television company, three other things are of note also emerged from the agreement. The first was that not all uses of music were permitted on the independent television network, leaving scope for further negotiations. Musicians could only accept engagements directly with the contractors and were not permitted to work for other companies who were making either films or adverts for use on the network. The second was the Union’s claim that the agreement ‘recognises many principles never accepted by the BBC, and may have far reaching effects upon other fields of employment’5. For the Union, the deal with the ITA provided a platform for further concessions and negotiations with the Corporation, which employed far more musicians than the commercial operators. Finally, it was decreed was that all musicians performing on ITV had to be members of Union. Much as the Union frequently dismissed notions of a closed shop in the profession, this was one of a number of agreements they brokered which restricted work in particular parts of the profession to Union members. Specifically, the agreement insisted that any musician (with a few noted exceptions) employed by the TV companies ‘shall be or become a member of the Union before his performance hereunder’. The initial deal with the contractors lasted for two years, and was subsequently renewed but the relationship between the Union and the commercial television operators was not always a smooth one and never as close as that it enjoyed with the BBC. Tellingly, less than six years after the launch of the MU, the Union sensed a chance to revisit its position on commercial television when giving evidence to one of the numerous post-War reviews into broadcasting in the UK6. The Pilkington Committee, which was set up in 1960 and reported in 1962, had, as part of its remit, to recommend on the allocation of a third TV channel to either the BBC or ITV. Its report was scathing in its assessment of much TV content (‘of very little value . . .superficial, cheaply sensational. . .vapid and puerile’)7 betraying a form of cultural elitism that made its predictable conclusion – that the third TV channel be awarded to the BBC – a good outcome for the MU. The Union, for its own reasons, contributed to such a narrative. Its evidence to the committee claimed that ‘commercial TV programmes have been of a low standard and the BBC has had to lower its standards to compete for the audience’ asking the committee to ‘consider the true purpose of television’8. For the Union this entailed only live programmes, arguing that ‘TV should allow people at home to see and hear transmissions of events simultaneously with their occurrence’9. In musical terms, this would maximise musical employment on television and minimise competition form repeat performances. 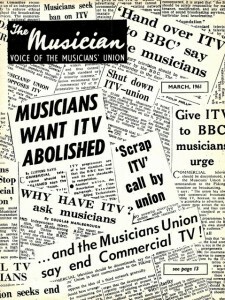 In its submission to the committee, the MU had gone as far as to suggest that ITV should be abolished and handed over to the BBC, as illustrated by the cover of its magazine The Musician from March 1961. Throughout, its stance sought to minimise competition, both to the BBC and for musicians performing live. This meant that the outcome of Pilkington’s committee (the third TV channel and local radio both being awarded to the BBC) further consolidated the Union’s power over the use of music in British broadcasting. It was, however, merely a skirmish before later battles surrounding the launch of commercial radio (independent local radio launched in 1973 after much resistance from the Union) and its expansion during the subsequent decades. When faced with Conservative governments under Ted Heath and Margaret Thatcher that favoured the opening up of broadcasting to the market, changing public demands and declining trade union power, the MU’s influence over broadcasting gradually waned. It was still powerful enough to negotiate punitive conditions on the first independent radio stations and has retained some influence over the BBC – particularly in protecting the jobs and conditions of its orchestral musicians. However, a range of legislation culminating in the Broadcasting Act of 1990, means that the MU is no longer able to exert the type of influence it had in 1955 over how musicians worked in the broadcast industries and what they got paid for doing it. Indeed, in a sector now dominated by commercial concerns and where public service provision is under constant attack, the remarkable part of the story is that the MU was once powerful enough to threaten both the launch and continued existence of what was then the UK’s only commercial broadcaster.